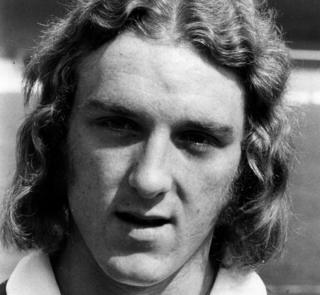 "Beat" arrived at Portman Road as a 15 year old and progressed through the youth ranks, making his debut against Manchester United in 1972. Beattie went on to make 296 appearances for the club, scoring 32 goals and consistently finished at the top of supporters' polls as Ipswich Town's top player of all time. He was a PFA Young Player of the Year, an FA Cup and Uefa Cup winner and won nine caps for England. He had spells at Middlesbrough and Colchester, but returned to the town and lived in a council-owned bungalow, where he cared for his wife who has multiple sclerosis. A pundit on BBC Radio Suffolk, he remained in the role following his conviction in 2012 for not declaring the job while on benefits. On Saturday afternoon, he broadcast from the studio for his regular slot on the Life's a Pitch show. He laughed and joked with presenter Mark Murphy and praised the support of Ipswich Town fans during a discussion about improving the atmosphere at Portman Road. Mr Murphy said he had been on "fine form" and added: "To say I'm devastated is an understatement. "He was my co-host for the past seven years and I am proud to call him my friend. "He was without a doubt the greatest ever footballer to pull on the Ipswich Town shirt. "The fans idolised him and he loved the fans with equal measure. He would be mobbed wherever we went. "I will miss him terribly." Ipswich Town said everyone at the club sent their deepest condolences to Beattie's family and friends. There will be a minute's applause before Tuesday's game against Brentford and the players will wear black armbands. Mark Murphy at Breakfast on BBC Radio Suffolk from 07:00 on Monday will be dedicated to Beattie.